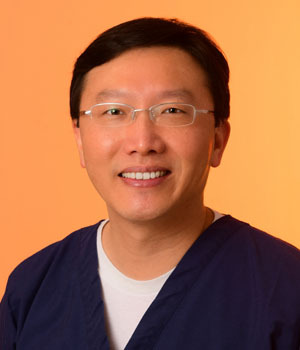 Dr. Jack Liu - Cedar Rapids Endodontics P.C. Born and raised in Taiwan, Dr. Jack Liu planted his roots in Iowa in 1992. Dr. Liu received his PhD in Biochemistry in 1997 from Iowa State University. In 2001, he received his Doctorate of Dental Surgery from the University of Iowa College of Dentistry, and his Certificate of Specialty in Endodontics in 2005. He has been practicing at Cedar Rapids Endodontics ever since. Dr. Liu is a fellow of International College of Dentists, and a member of American Association of Endodontics, American Dental Association, Iowa Dental Association, and Linn County Dental Society. Dr. Liu is an adjunct associate professor at the University of Iowa College of Dentistry. Dr. Liu and his wife, Emily have three children: Chris, Austin, and Jamie. Chris is also a dentist in Iowa, Austin is teaching computer science overseas, and Jamie is a dentist in the making. Dr. Liu enjoys learning about new cultures through traveling, watching movies with his family, and cooking in his free time.